Stay comfortable and looking fresh no matter where the job takes you while wearing the Women's Short Sleeve Performance Polyester Polo from 5.11 Tactical. Designed for active professionals, the shirt is perfect for bike patrols, training exercises, wear around the office or any scenario where a Class A uniform is not required. Featuring a 100% no snag polyester construction, the shirt offers a slight shine that looks great while retaining maximum breathability. 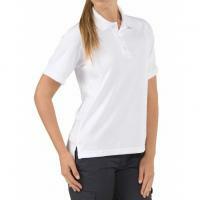 A sleek no roll collar stays put throughout physical activity and keeps the user looking fresh all-day long. Built-in shoulder and placket mic clips add to the shirts tactical functionality by providing platforms for radio integration while reinforced pen pockets offer convenient item storage.